Do You Have a Gas Smell Inside Your Car? "What causes the smell of gas inside a car?" is a question I hear almost every day. A gas leak might make sense as the most likely cause; but more often than not, the cause is unburnt gasses leaking from the engine or exhaust, in places where most people would never even think of looking. Here are five possibilities worth checking out. Open the hood and look at the area around the oil cap, if you notice oil and debris collecting on the valve cover just below the oil cap, most likely the o-ring is worn out and is leaking, causing fumes from the engine, which "smell like gas” to leak out and be drawn into the HVAC (Heating Ventilation Air Conditioning) fresh air intake located directly below the windshield. Inspect the o-ring for any damage or missing parts. If it looks flat, you may need to just replace it with a new one found at any local auto parts store. 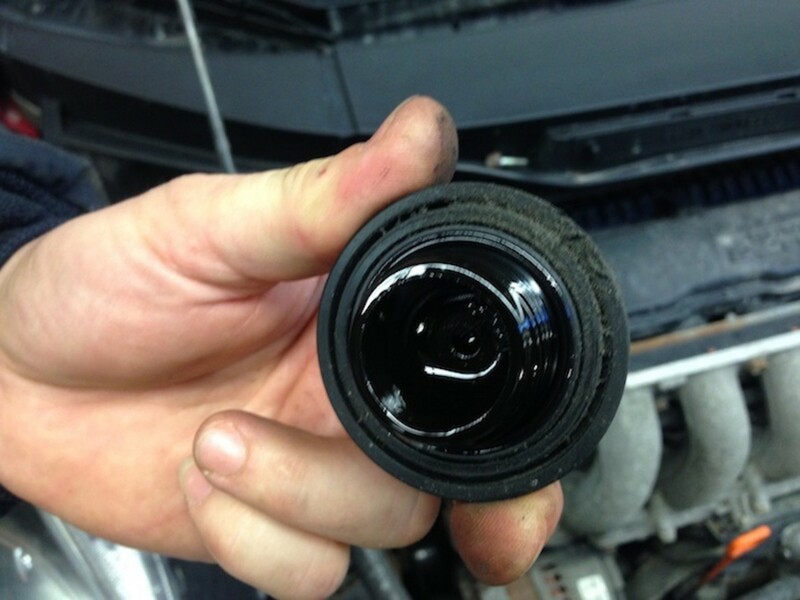 Check the oil cap for cracks, if you see any cracks, replace the entire oil cap. It may be a little difficult to get the right one because there are so many different sizes. If your local auto parts store doesn’t have one you could try the dealership or salvage yard. Sometimes the solution for a problem is an easy fix, but it is often overlooked! First check to see if all the spark plug wires or coils are in good shape. Remove each one from the spark plugs one at a time, so you don’t mix up the order they are in. 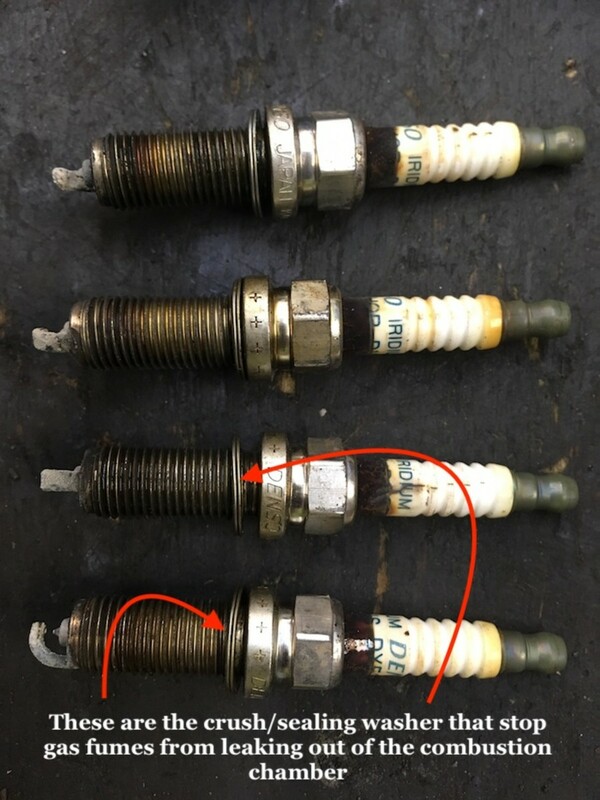 If all the spark plug wires and coils look OK, check the torque on the spark plugs. If you don’t have a torque wrench, try this method. Back out the spark plug a little so you can turn the plug by hand. Now tighten the spark plug until it bottoms out by hand. Use a ratchet and socket to tighten the spark plug a quarter turn or until it's snug. A quarter turn would be for example turning the ratchet handle from the 3 o’clock position to 6 o’clock. Check each spark plug one by one until you have tightened each one to the proper torque. Open the hood and use a flashlight to look for any dark oily wet spots on the engine. Valve cover gaskets are notorious for leaks. They sit at the top of the engine and absorb the most heat, which causes them to fail sooner then most gaskets. Also they sit right above the exhaust manifold which is the hottest section of the exhaust system. Inspect this area closely for any drips going down the back side of the engine. Look for any smoke coming off the engine when it’s hot. Smoke coming off a hot engine is a good sign there is an underlying oil leak that you cannot see. To find a small leak, you may need to bring the car to your local mechanic. 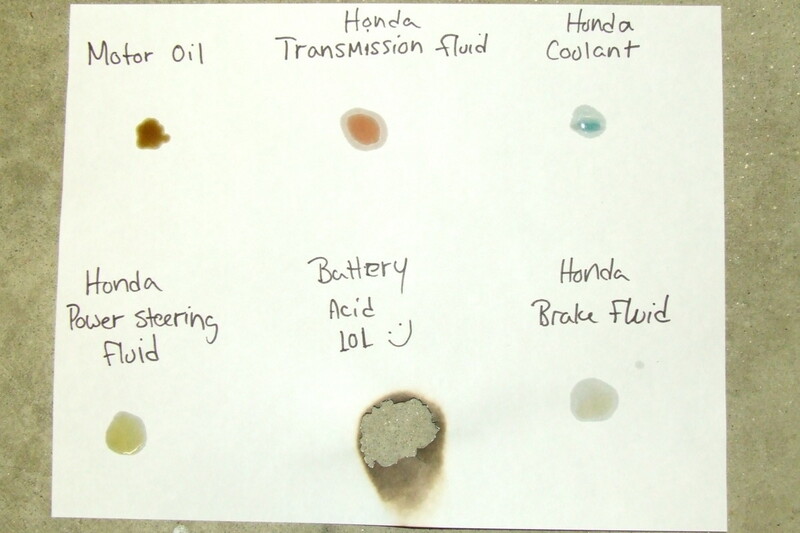 Have them clean the oil off the engine and then add a fluorescent dye to the oil. This dye will glow green when a special UV flashlight is used to inspect the leak area. Exhaust leaks are another common fuel smell that gets drawn into the passengers compartment via the HVAC fresh air intake, especially if the exhaust leak is close to the engine and before the catalytic converter. 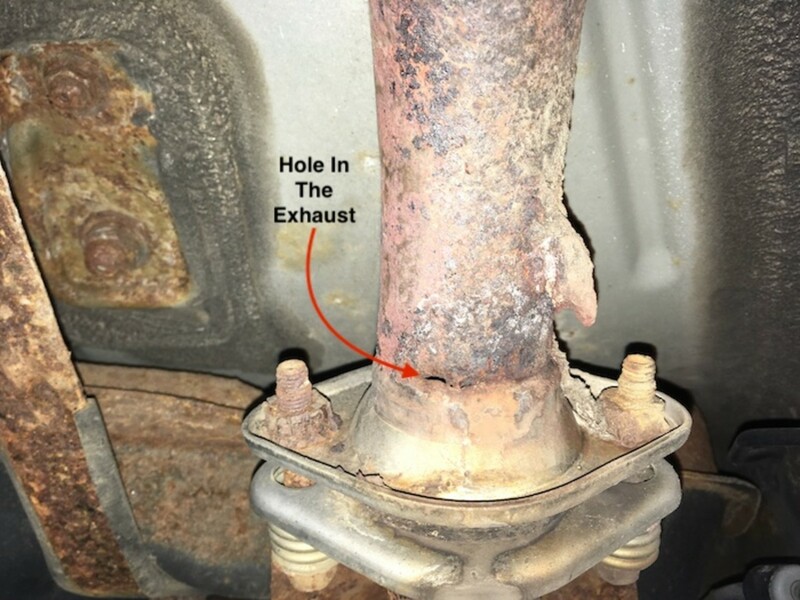 An exhaust leak before the catalytic converter can have a pungent fuel smell, because the exhaust includes a lot of unburnt gasses before the converter cleans them out of the system on the way to the tail pipe. Listen for a louder-than-normal exhaust noise, if you accelerate and the engine sounds loud or different, you could have an exhaust leak. Listen for a ticking noise when accelerating. 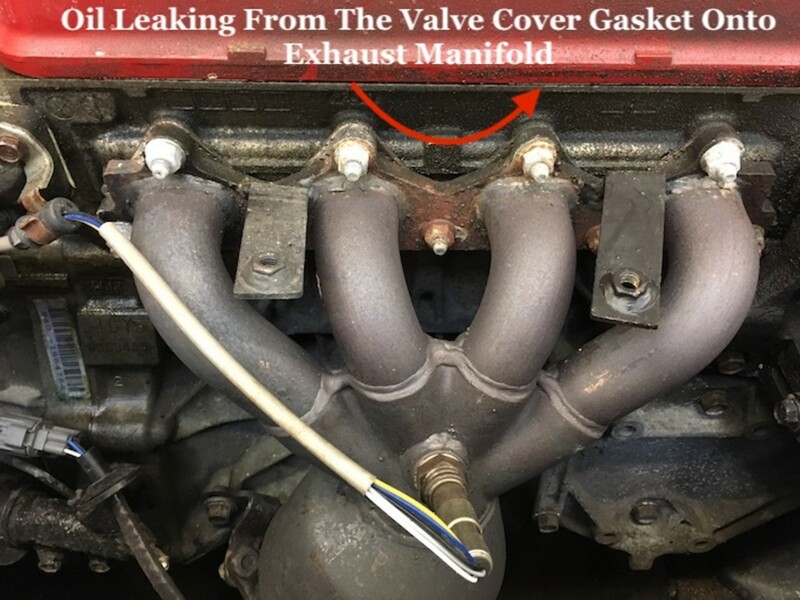 If the exhaust leak is close to the engine, the exhaust leak will make a loud ticking noise like someone tapping on a pie plate, if you hear this type of noise on acceleration, have your mechanic check your exhaust manifold for leaks. If you think you may have an exhaust leak but are not sure, try placing a doubled-up towel over the tailpipe and put your hand over the towel to stop the exhaust from exiting the tailpipe. If you don't feel the pressure building up at the towel, most likely you have a leak somewhere in the exhaust. If you have dual exhaust pipes, you may need an assistant to help block the other tail pipe at the same time. Note: Some mufflers have vents at the bottom to allow moisture to drain; don't confuse this drain with an exhaust leak that needs fixing. 5. 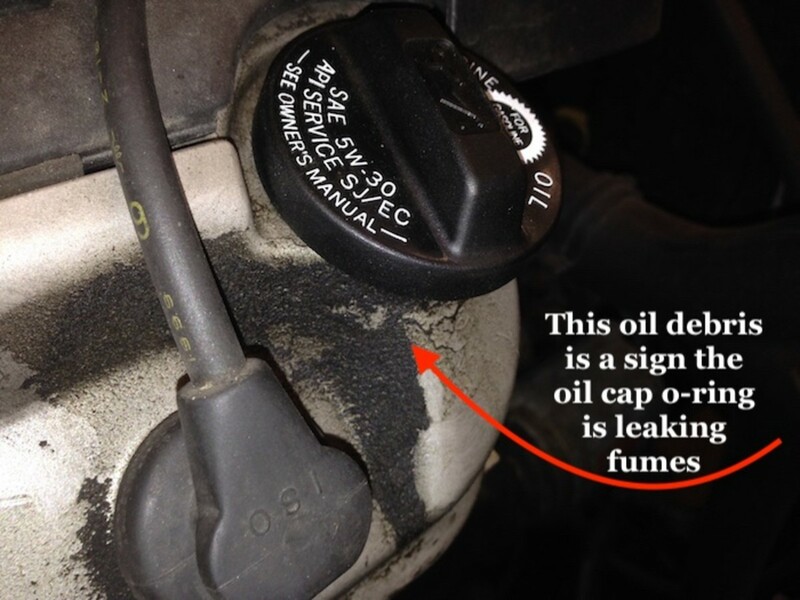 Is Your Oil Cap Missing? Open the hood and check to see if your oil cap is missing. If the cap is missing, look around for it in the engine area. Most of the time when someone removes the oil cap, they will set it down on top of the valve cover, and if they forget it, it often falls into the engine compartment. If the cap is gone, replace it. Don’t drive the car without it because that will sling oil all over the inside of the engine compartment. What Causes a Gas Smell Inside Your Car? Gas smells don’t have to be complicated repairs; that’s why the problems mentioned here are overlooked so often. When a customer complains of a fuel smell, the first thing their mechanic will look for is a fuel leak. Or they may say, “You must be smelling the exhaust from the car in front of you.” If you smell fuel or gas while driving, check the items listed in this article, if everything looks OK, leave a question in the comment box below and I will get back to you. My car is leaking gas and it has troubles starting up, I can smell the gas very strong. do you think it's a failed fuel pump? You'll need to find the fuel leak first and fix it. This is probably why your car is starting hard; it's losing fuel pressure. Why am I smelling gas when I turn my car on in the morning? I recommend checking the oil cap for any signs of leakage, if everything looks ok, have a mechanic check it out asap to be on the safe side, gas leaks can be very dangerous. My 1994 Suzuki Sidekick has had trouble starting for years. The only way that I can get it to start is to pump the gas. Recently, when I pump the gas to start it, smoke comes out of the tailpipe and I smell gas in the cab of the car. It has a manual transmission and over 150k miles on it. What is happening? I think your engine is getting tired or it may need a good tune-up. If you have not done any basic maintenance like spark plugs, spark plug wires, distributor cap and rotor, engine air filter, etc., I recommend you start with replacing these items and see if the engine starts any easier. Suzuki Vitara 99, starts smelling like burnt gas or something like kerosene only when we exceed the 50 mph mark. Could my Suzuki Vitara be leaking or something worse? You may be smelling exhaust fumes entering the passengers compartment. I recommend checking the vehicle for any exhaust leaks first or any rust holes in the body where exhaust fumes could enter. Why is my car struggling to start when I am trying to turn it on? It has no power. If the battery doesn't have enough power to turn the engine over easily, it's possible you just need a new battery. I recommend having someone test your battery and replace it as needed. 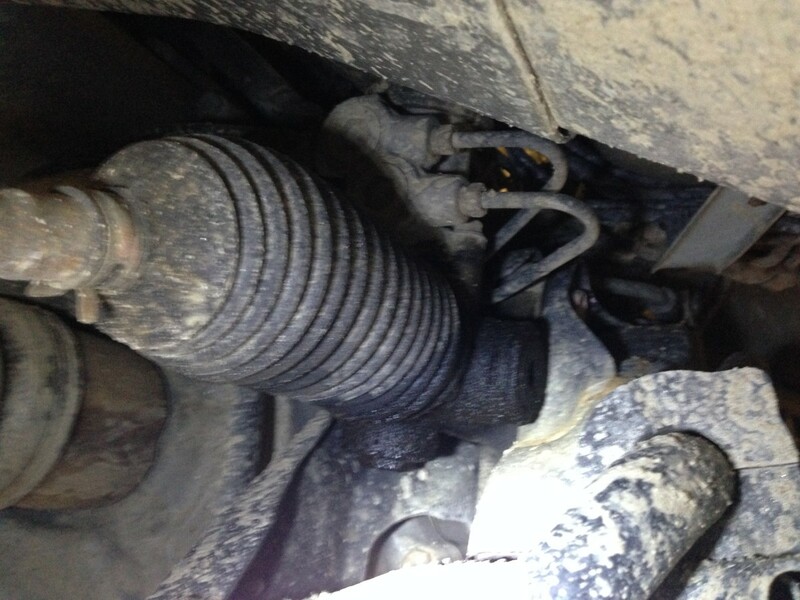 If you don't notice any leaks under the vehicle then you probably don't have a fuel leak. If the exhaust leak is near the engine, it's possible you are smelling the fumes from the exhaust entering the cabin from the HVAC fresh air intake near the bottom of the windshield. 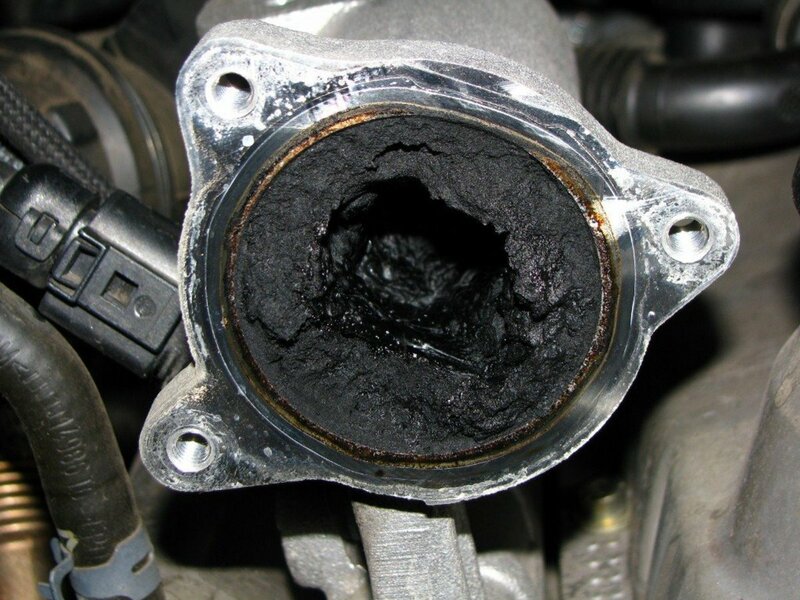 Leaks in the exhaust manifold can cause a ticking noise on acceleration and a strong smell of gas because the leak is before the catalytic converter. If you want to check for any fuel leaks, you'll need to use a flashlight and follow the fuel lines from the tank to the fuel rail on the engine. 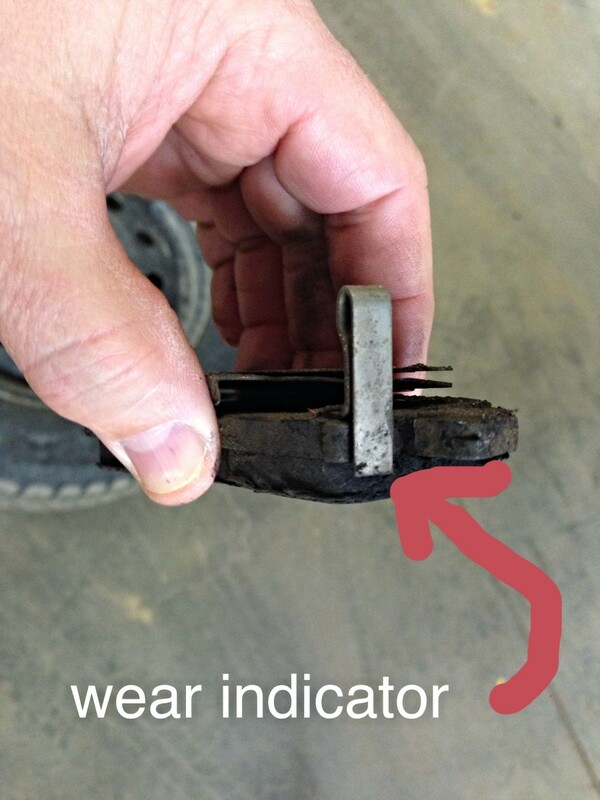 If you check these areas with the engine running you will be able to find leaks if there are any. Let me know if you have any other questions, thanks. I drive a chevy blazer ( around 1999 or 2000 i think), i know the car has a small exahst leak, which my dad told me when i got it is fine and not to worry about it, and has a ticking sound and a loud engine, but only resently did i start noticing a fairly strong smell of gas inside the car while driving, but is not present on the outside of the car. Also when my car reaches above 45 mph i can hear what sounds like fluid being spat out of somewere, but from what i can tell there is no visable puddles or leakage under the car after i park or leave it parked for some time. From what i can tell there is no visable leakage under the hood and all my fluid levels look as if theve had no noticable changes. I should mention that my gas gage does not work so i can not tell how much gas i have or if theres been any drastice changes in is use. Also some time ago i had an insident were i accidently overfilled my car and lots of gas leaked from the gas tank, from what i can tell tho it had no real effect on car( as far as i know) and had no lengering gas smell nor any initial performance issues afterwords. That was months ago and the gas smell has only arisen about a day ago as of the time i am typing this, so i dont know if its related. I have a very limitted understanding about cars and my only real assumption is that the "small" exahst leak is no longer small and has gotten worse. But i dont know. Are you sure you're not smelling the new leather materials or solvents they used to repair your car? I smell gasoline when i get in the car, the smell disappears once I start the car, AC on and drives for few minutes. I recently have my headliner changed and car seat upholstery fixed with faux leather materials. The gasoline smells started right after the upholstery was done. There’s no warning light also to indicate any leaks. Take note I just recently did the regular service at the dealership. ***** Article gets five stars! It's possible you have a leak in the top of your fuel tank and when you fill it the fumes get pushed out the top of the tank. when I put gas in my 97 park avenue it makes gas fumes come in the car when driven. Why is that? Have you checked everything I talked about in the article and video? My car Toyota Rav 2005 starts smelling gas when the engine idling is going up and down. From 1k to below 500 rpm. And there are time the engine dies. 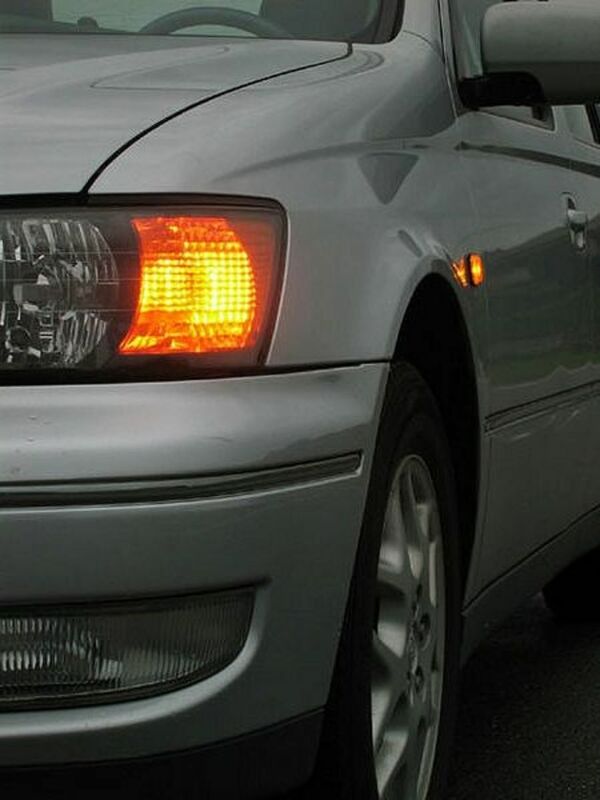 Sometimes turning the engine off, then on after a few seconds brings it back to normal. I am sureot sure what to do? I tried bringing it to Toyata service center but the issue is recurring. What type of smell is it? Like something died or a gas smell? Whatever it is it would be coming in from the fresh air intake as you said. When the recirculation button is on you don't smell it because you're recirculating the cabin air. Even if my AC/fan is off, when i get to around 60km/h a smell comes through the vents, like I said, even if everything is off. I had the guys disinfect the system and replace the pollen filter (their recommendation). I smell it constantly when the fan is on, but not when the AC is on (and cabin circulation is on). Any ideas what it could be, i thought since it comes through even when everything is off, i figure it must be somewhere by the intake? or a leak of sorts? I have a 2017 Honda Pilot with 22,000km. Just after using the AWD in snow mode going up a steep hill, we noticed a strong pungent smell coming through the heat vents while idling. It continues to happen when idling after stressing the engine (ie driving on the highway). We have taken it to the shop but they couldn't duplicate the issue. I don't think they even took it for a drive.the smell is sort of like propane but it has a sour smell and makes your eyes water. Any idea what this could be? If a rodent has died in your vehicle, I recommend checking inside the blower motor assembly and behind interior plastic panels, sometimes they crawl behind the body panes inside the car, get stuck and dye. I know my videos are slow and boring but it would most likely be one of the 5 problems I mention or a fuel leak. Hope this helps. my 03 Chrysler sebring has a gas smell coming through when I turn the car on. what could it be? My car smells odder like carbon monoxide.. two passengers vomited after travelling in my car including my mum she is 87yrs. I gave my Nissan XTrail to agent to check they think may be rat went inside. Still keeping the car to find the rat. But i doubted something else. Pls advice me. Do you see any leaks or drips on the ground where you park? Does the engine have to be running to smell gas inside the car? Do you smell gas outside the car? I am driving a vw polo classic it smell gas inside especially when the tank is full. What might be the cause? So most likely the problem is close to the engine compartment. Are you absolutely sure it was gas? If so, you probably had an open in the fresh air intake tube causing a backdraft which sucked some of the fuel back into the intake tube. The engine must have backfired through the intake and ignited the raw fuel. I recommend you start by checking everything I talk about in the article and video. Am using toyota carina e 1997 model and is consuming more fuel and also smeeling fuel inside the car when engine is hot. My Girlfriend has a 1999 Toyota 4 Runner .When she got to work on her 4 runner she turned off her car.Like 15 minutes or so later she turned on her 4 runner truck.What really was the odd thing about her turning back on her 4 runner was that on startup a loud noise came from the hood area.To come to find out that the air filter was on fire and noticed that the boom sound cause the air filter cap had fluw opened.When i removed the air filter there was a puddle of gas inside the air filter compartment why ? Have you ever took a flashlight and inspected the engine compartment during startup? It's possible you may see, hear, or smell something if you look closely. Do you have any exhaust leaks near the engine? Did you replace the exhaust or intake manifold? Did he clean up all the oil that dripped on the engine? It could just be the residual oil that got on the engine or exhaust burning off. My boyfriend just changed the oil and rotated the tires on our 99 mustang, now there is strong gas fumes coming from the right front side, what could be the problem? If the exhaust system has any doughnut gaskets or flexible flanges with spring bolt, they would be the most likely cause. I really wouldn't worry too much tho because you are pushing the car hard and some parts are bound to slightly fail, unless you have upgraded to extreme high performance parts. Hope this helps. I have a highly tuned 2017 Passat R-line. It has a bespoke exhaust system. When the car hits high revs there is an exhaust smell in the car. We have checked and find no evidence of a leak, and there is no smell when driving normally. There are new gaskets and a new exhaust system including a down pipe from the upgraded turbo. Something is dumping fumes into the engine compartment and someone will have to use their noise to find it, it sounds silly but true. 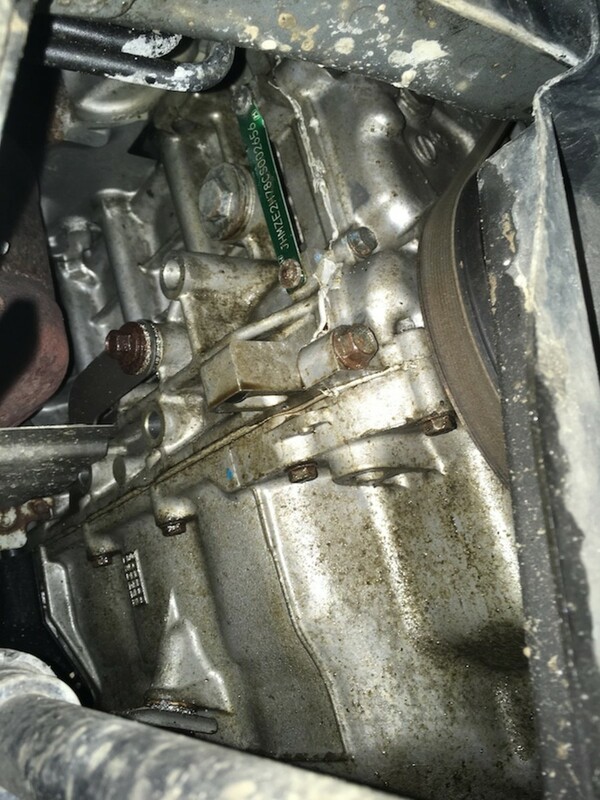 Has anyone tried blocking the purge control solenoid line off in the engine compartment? If you smell it at idle, it shouldn't be impossible to find. Are there any oil leaks anywhere? Where is the canister located? if it is close to the firewall, I recommend checking that out as well. Keep me posted, thanks. If you're smelling gas when the car has been sitting and it's on the inside of the vehicle, most likely you have a fuel leak under the vehicle or it is close to the fresh air intake near the bottom of the windshield. I recommend having the vehicle checked out closely for any fuel lines leaking in the engine compartment, if it all checks out good, I recommend checking the other fuel lines coming from the gas tank. I have a 2013 Tiguan. Today I felt the gas smell after I stopped the engine and park the car for a while, like 1 hour. Also in the morning, when I opened the door, a very strong gas smell in the cabin. But I cannot feel the smell after starting the engine and driving. Hello! Have a 2008 Mazda 3, low miles. Started to smell "fuel" two months ago with vents on fresh air when idling. Odor largely dissipates on driving, but not so much during traffic/city driving. No odor if using recirculated air, but this cannot be done in the winter. Odor began after a 300+ mile drive about 2 months ago. New spark plugs installed just last summer. Has been examined by Mazda mechanics at length, several times now. 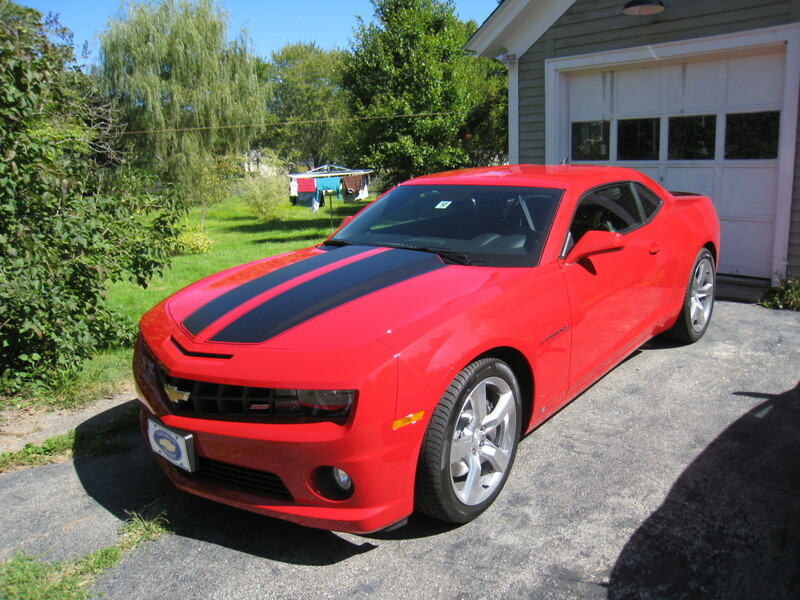 No issues w/ oil cap, spark plugs, fuel injectors, fuel rail, or fuel line. No visible leaks, residue, or signs of exhaust leaks. Car starts and runs just fine, however fuel efficiency has decreased a bit. Replacing o-ring seals on fuel injectors did not fix fuel odor issue. 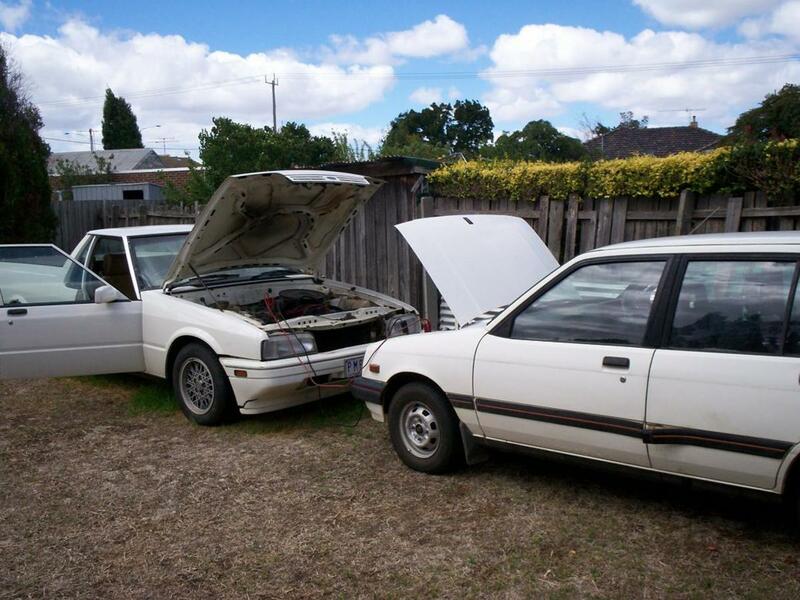 Mazda mechanics are at a loss. The only thing they offer at this point is replacing fuel rail/injectors, but can't guarantee it will fix odor issue. Help! Do you have any suggestions? Any help is much appreciated! Thanks! 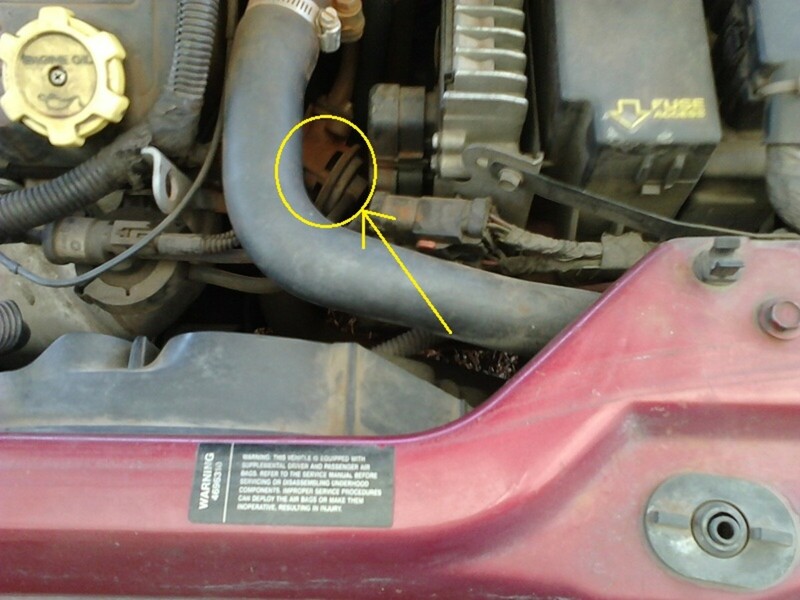 Possible rotted fuel line that just let go? Any signs of leaks under the truck? For two day I smelled gas in my 97 Chevy suburban and then I started it drove then it just shut off what do you think could be wrong. Yes the filler cap is on top of the engine where you add oil and it should have an o-ring, sometimes it's hard to see because it's embedded in the cap so look closely. Hi, I'm driving a 2003 seat Ibiza. My car currently smells like gas and it's even worse when I turn on the heating for the windshield. I suspect it's the first symptoms you mention, maybe a missing o cap. I went to buy one and they said it usually comes with the filter. I went to YouTube and found out there are 2 caps, the filler cap and the oil filter cap. I think I mistakenly bought the filler and the o ring together since it clearly is larger than the filler cap. 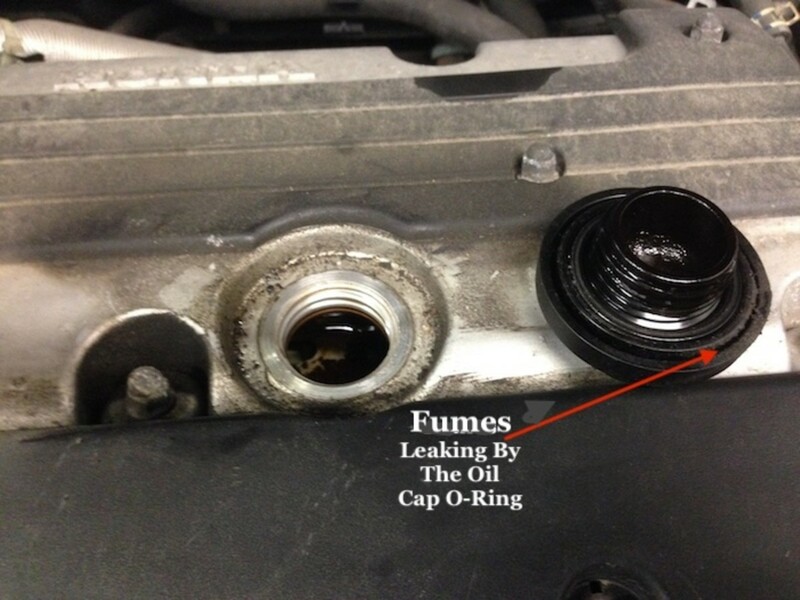 Is the oil filler cap supposed to have a o ring? Because there is no trace of any on mine.. And just to be clear, is the oil filler cap the one on top of the engine where you add oil after checking the oil levels? Thanks! There are a lot of things that can cause a gas smell as you can see in my article and video. I recommend getting a check over or diagnosis of the smell, if you can smell it all the time, it shouldn't take much to find the source by an experienced mechanic. Let me know if you have more questions, thanks. It could be a clogged catalytic converter or slipping clutch? Is this a manual or automatic transmission? Is the check engine light on? As I wrote in the article it could be exhaust fumes leaking from the engine and entering through the fresh air vent. I recommend having everything in the article inspected like oil leaks, oil cap leaks, spark plug leaks, or any other gaskets near the engine and exhaust. My 2009 Subaru Legacy is struggling to accelerate especially on any incline. When I push on the accelerator to gain speed, the engine revs like it's gaining but it doesn't, and then I smell the fuel. It's been getting poor gas mileage also. There doesn't appear to be any leaks, oil cap is tight and unworn. Could it be the fuel filter, airflow sensor or perhaps a bad or clogged fuel injector? Your thoughts, please. Thanks for the post! I smell gas at all times (when the car is running and when it's idle) in the cabin of my Hyundai Elantra. I don't see any gas leaks like on the ground.. Do you think it would be expensive to get this fixed? You need to have someone check out the leak to identify what the fluid is first. That could be your whole issue. Can you see fuel leaking onto the ground? If you can smell fuel leaking when fueling, most likely the filler neck or fuel tank have a leak. If my car has a bad gas leak especially when i put gas? You can liyerally smell the gas from my front door? Do you smell inside or outside the car? when i turn off my car it smells like gas but there is no gas leak? Did you read the article and watch the video? They will give you several things to check and also explain the common causes. I have 2007 Nissan Sentra and I am smelling gas what causes this? Thanks for the information. This will surely be of use if someone should detect the smell in their car.